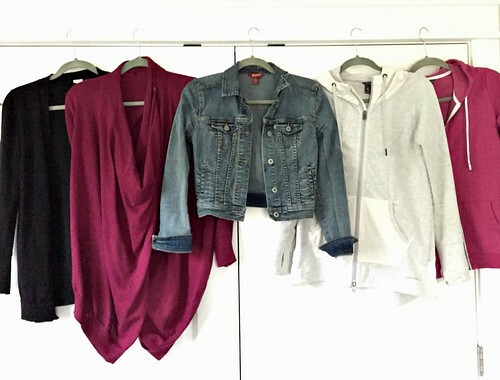 Do I have a capsule wardrobe? How would someone go about creating their own capsule wardrobe? What staple items of clothing would I recommend? 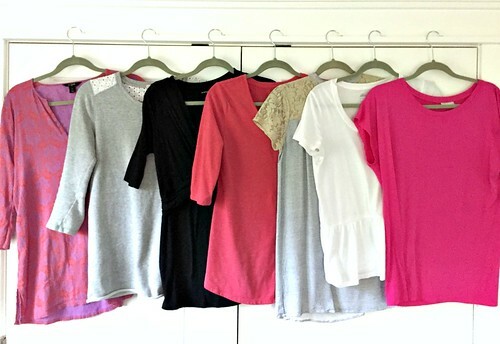 Sometimes, I’ll also send them a link to the Mix ‘n Match Wardrobe Post I wrote 4 years ago or the 6 Reasons A Capsule Wardrobe Might Not Work for You post I wrote 3 years ago — they seems to be satisfied with those answers! 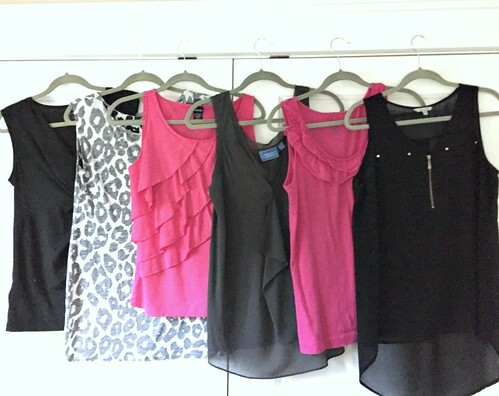 HOWEVER, over the past 3-4 years, I’ve done a major wardrobe overhaul… and I realized I DO actually have somewhat of a “Capsule Wardrobe” — it’s just a really BIG Capsule Wardrobe! As I’ve mentioned before, I’m most definitely NOT a minimalist in any area of my life — except maybe my schedule! That said, when it comes to what I wear, I NEED to keep things simplified and streamlined, otherwise I struggle from decision fatigue and just end up wearing the same 3 or 4 things over and over and over again — which defeats the purpose of buying clothing in the first place! So, like I mentioned earlier, my wardrobe is FAR from “minimalist” but it IS somewhat of a capsule wardrobe by definition. In my opinion, I have that definition of a Capsule Wardrobe… because 99% of my clothing is interchangeable, which greatly maximizes the number of outfits I can create — especially considering I have a fair number of pieces in my wardrobe to begin with! If you think this sounds very boring — I completely understand. HOWEVER, I promise you that I never get bored of wearing these colors because I feel great in these colors. Also, as you’ll read below, I have enough items in my closet that I really can wear SO many different outfit combos that I don’t have a chance to get bored. As a real-life example, I went back through my photos from last week, all the way back to when Clara was born and pulled out all the pictures of me. Even without planning what I was wearing or thinking about the possibility of this upcoming post, you can see I ALWAYS wear the same colors, but rarely the same exact outfit. 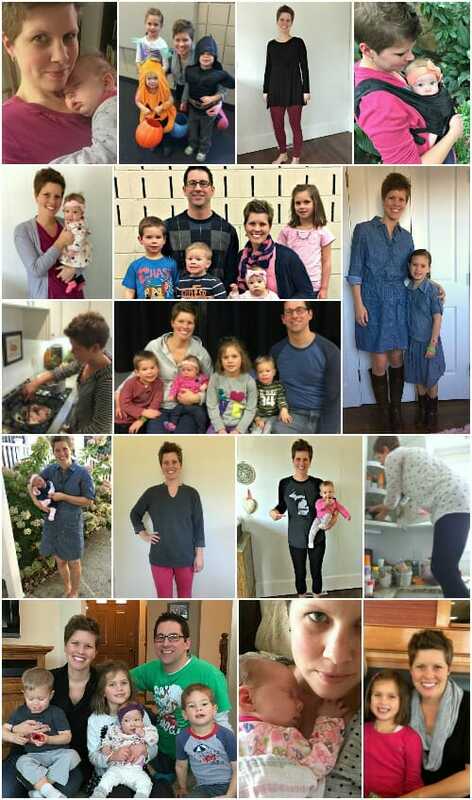 Several months ago, I purged ALL my maternity clothing (hallelujah! 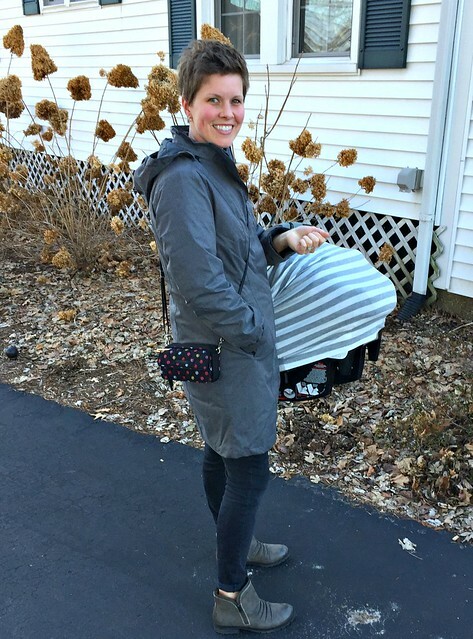 ), all the “slightly too big” items I wear for the first couple of months after I deliver, and anything that didn’t look and feel really great on my new mother-of-four body shape. 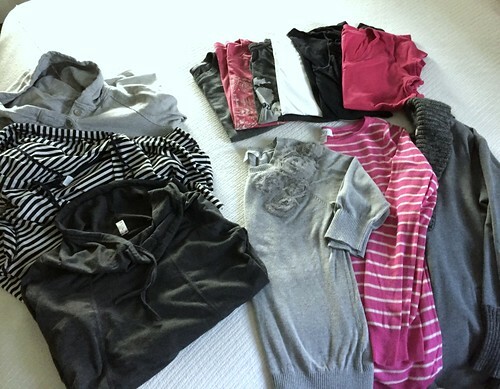 At that time, I also altered several pieces of clothing to work better for me now — shortening outdated pants into capris or Bermuda shorts, slimming down tops that are now too big for me, hemming skirts and dresses that weren’t really long enough to be maxi length but now look cute as a shorter style, and cutting up several of my sweatshirts for a more updated look. I updated 15 items of clothing that didn’t flatter me or work with the current styles… and now they all fit again and I have significantly more clothing options! Then, about a month ago (after finally losing the last of my baby weight) I decided it was time to add a few new pieces to my closet in preparation for spring. Plus, it had been a REALLY long time since I purchased anything “new” for myself. I say “new” because every single item I purchased for myself was actually used! I found a handful of items on Swap.com and Thredup, and I made out like a bandit at a local thrift store over spring break! They had a sale where every item of clothing was $1… and I walked out with 20 new-to-me items for spring and summer… yes, for $20 total!!!! Currently, my wardrobe is larger than it’s been in a very long time — but when you get cute, brand name clothing for $1 a piece, it’s really hard to turn them down! Plus, after altering so many of the items I already owned, I truly feel like I have a brand new wardrobe for right around $50 (the cost of the clothing from the thrift store, Swap, and Thredup). In the interest of time, I will NOT share pictures of every different outfit — but it’s safe to say I have hundreds and hundreds of different combinations based on the tops and bottoms I currently own. Here are a bunch of my pants, capris, skirts, shorts, and workout pants. 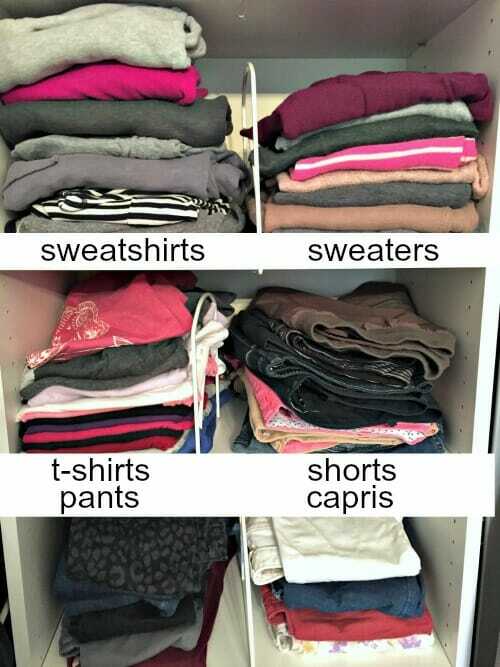 These are the majority of my sweatshirts, sweaters, and t-shirts. Here are a few of my many cardigans, hoodies, and jackets. These are some of my favorite three-quarter sleeve and short sleeve tops. These are my favorite sleeveless tops. 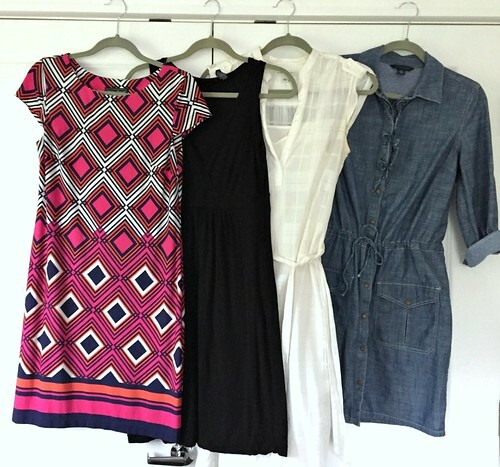 Some of my dresses for spring. And the majority of my footwear. As I mentioned above, every single item I purchased for myself this spring (and every single item pictured above – minus 1 hoodie) was purchased USED! 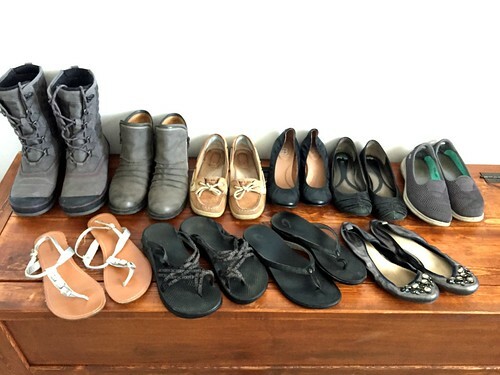 These are things I paid $1, $3, or maybe $8 for from second hand stores, thrift shops, and online garage sales — and I truly didn’t spend more than $50 total on everything I purchased to update my wardrobe this spring (roughly 30 items total). I know thrift shopping won’t work for ever body type or every demographic area, but I’m convinced that one of the main reasons I’ve been able to do so much thrift shopping over the past 3-4 years is because I’ve created a form of a capsule wardrobe for myself — even though it’s NOT minimalist in anyway. 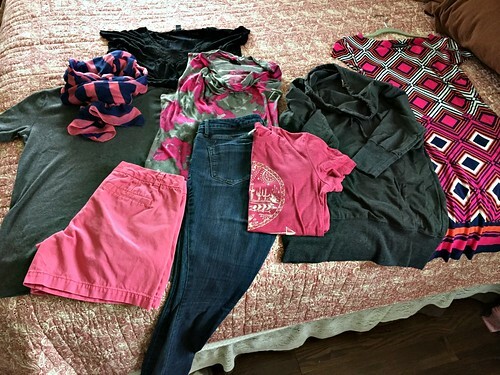 And speaking of not being minimalist… I know several of you will ask, so I did a quick count and listed out the different types of clothing I have below, along with how many of each item I have. See… told you I wasn’t a minimalist! I don’t plan to buy anything else for myself until fall, but it was fun to find so many thrift store deals over the past couple of months. 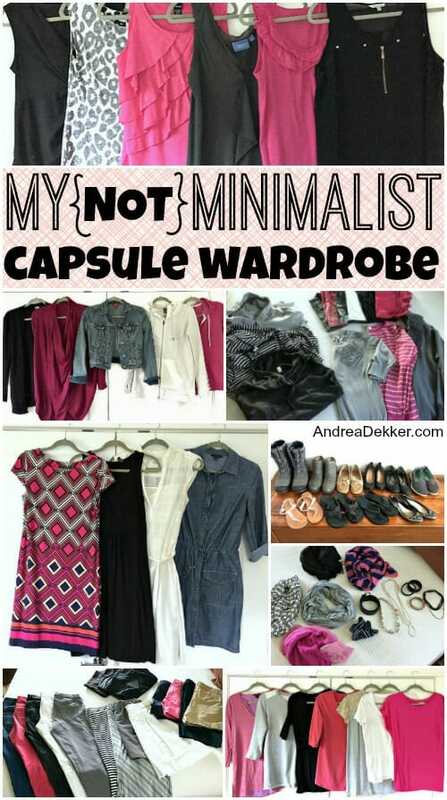 If you have an ultra-minimalistic capsule wardrobe, I think that is fantastic. There have been so many times in my life when I think how fun and freeing it would be if I could have so few items in my closet. However, as I shared a few years ago, there are many reasons a true minimalist capsule wardrobe will not work for me — and I’m OK with that. To feel great in what I wear. To have practical, kid-friendly, yet cute options for all the crazy weather we experience in West Michigan. To have almost exclusively mix and match pieces. 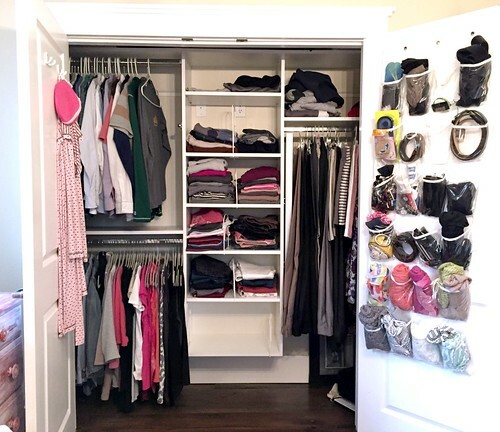 To have a decluttered closet with plenty of room to ‘breathe”. To do it all without spending an exorbitant about of money. So far, I have definitely accomplished these 5 goals… and I’m thrilled with the results! I’d love to know… what are YOUR goals for YOUR wardrobe? If you’ve never thought about this before, now is a perfect time of year to do it! Take a few moments to think through the types, styles, colors, and fabrics you love wearing and feel great in. Then, remove everything else. 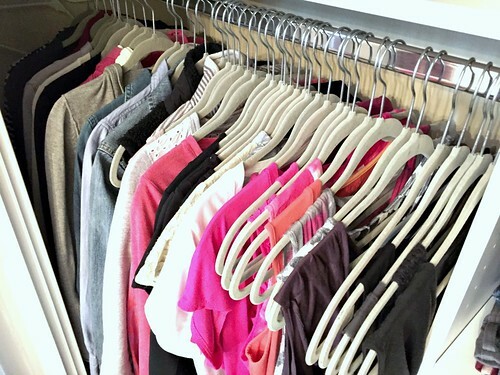 You don’t even need to purge it completely; just remove it from your closet for the time being so you can experience what it feels like to ONLY have things you love and feel great wearing staring back at you when you go to get dressed! I guarantee it will be more fun to get up and get ready in the morning! 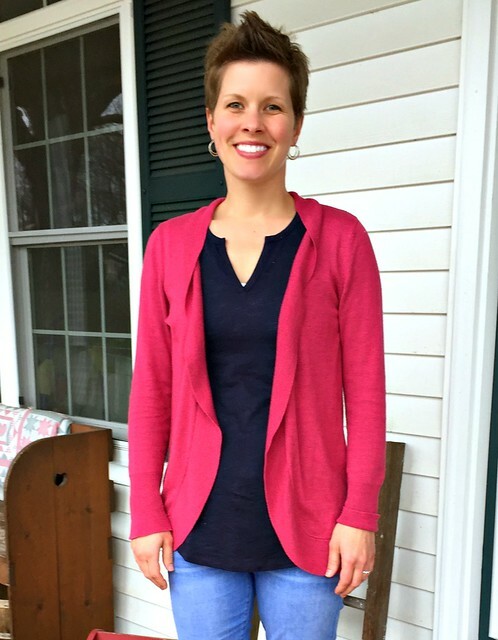 I also love Loft jeans and recently gave Thredup a try. Love the concept and got some great items. I’m struggling to find how they differentiate between modern and curvy fit on the website. Curvy doesn’t work for me and I had to return a couple pair (at 1.99/ea restocking fee). Have you had this same issue? yeah… ThredUp JUST started charging the restocking fee last month (big bummer!) Before that, you could buy as much as you want and return it all, no questions asked, for a full refund. I’m not sure how much back-lash there’s going to be regarding the $1.99 restocking fee, but I wonder if ThredUp isn’t doing well financially. Maybe they need to recoup some of their costs with the restocking fee — either way, I doubt people will be to excited about that fee, so I could see their business plummeting as a result. As for curvy versus modern fit — I ALWAYS go with modern fit as I have very few curves anywhere 🙂 You could also go to an Ann Taylor store, try on a bunch of different styles untill you find the one you like best, and then shop for that style on ThredUP. NOT excited about the fee.. however, I talked to ThredUP customer support yesterday. They are going to start listing modern fit/ curvy fit in the description on their website. They don’t currently list it and there is no way to tell. I’m modern fit also, but am paying restock fee on curvy fit jeans that I got.. boo! Until they start listing in the description, you can chat with customer support, give them a specific item number and they will check with the warehouse and let you know if the fit is modern. What brands do you buy second hand? I usually look for Ann Taylor and/or LOFT for pants. I like Eddie Bauer or J.Crew for tops and shorts, and I’m a huge fan of American Eagle for jeans. That said, I’m not necessarily brand loyal — I mainly search for specific colors to add to my wardrobe. I personally feel this is a minimalist capsule wardrobe because you’ve already limited many colors and except for 3 types of clothing you only have less than 10 pieces in each type. This would be a major life goal for me. I like too many colors and can wear almost any color so it doesn’t help. haha — well good for you that you can wear almost any color. I find that pink is one of the best colors for me, and I like it so it works! also, keep in mind you might be more minimalistic in other areas of your life (like home decor or landscaping supplies) where I have more in those areas! 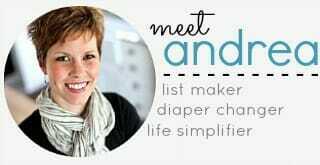 Andrea, Let me list a 6th goal you have also accomplished: to look great in pictures you post on your blog 🙂 Love how you go with what works for you. LOVE all the ideas you shared with us today. I sure hope ThredUp is still around when my girls are old enough to go to prom. I think most of the dresses I see worn for prom now cost more than my JCrew wedding dress! My goal is to keep purging and renewing like I’ve been doing. I also use a stylist to help select pieces that are classic and go well together (TrunkClub by Nordstrom). Andrea, I loved this post. I’ve followed you for a long time and watched your style morph over the years. I lwas fascinated by your post, and have often referred to it, after you worked with a stylist. I liked how she made you think about your preferences, fit, feel, color. It got me thinking too. After working with her, I really admired the updates to your style. Recently, I noticed your color palette change and realized I’ve been doing similar, although with a different palette.i can’t tell you how many times you’ve inspired me to make a change. I’ve adopted many of your systems. Often, they were things I didn’t think of as needing a system on until you shared yours, and once I adopted them I couldn’t imagine how I’d lived without for so long! I so enjoy sharing your journey and have come to know and love your family. I hope you keep sharing your corner of the internet! Looks like we love the same colors! I too don’t want a minimalist wardrobe— things wear out or get dirty and I like to have back up clothes . I think I need to start removing all the brown clothes I have and just stick with black and gray as base colors like you since they really are better on me. Removing “wrong “ colors seems like a good way to start purging. Yes! about a year ago, I purged ALL my brown, dark tan, green, orange, and yellow colors. It was So freeing! Even if I liked the piece, I just purged it because I knew I didn’t have anything to wear it with. You look great! That’s what counts, besides comfort, of course. I do think you would look wonderful in a medium blue, too, and it would go with all your stuff! You look really nice in the denim dress, for instance! Did you explain how you came up with your colors, if there was a method to it? Remember when everyone had to be a spring, summer, fall, or winter? Did you do something like that? I was inspired by your clothing posts to take a look at my closet. I found that I gravitate towards black, white, grey, anything striped(! ), red/hot pink, blue and mint green. Hmmm, that’s a lot of colors. But I know what I like and pretty much a lot of my wardrobe goes together. So, thanks for your great posts! yay!!! well, you know not to bother with yellow, orange, purple, brown, tan, etc. so that’s something! My goal is that is that everything is something I’m excited to wear that fits me now. And ideally has pockets. Where are your grey booties from. They look perfect. ah yes — pockets are amazing! the grey booties were from Kohl’s on a Cyber Monday sale. I do really like them (they have “cloud sole technology” and are super comfy) and get lots of compliments on them! I have very short legs, but since I can sew, I can usually alter longer pants to make them work for me — that won’t really work in your case though! For some reason, Andrea, it tickles me that you have mostly sober colors in your wardrobe, but then your other color is hot pink. I think of you as so thoughtful and productive and let’s-accomplish-things-today, and then here’s all this frivolous pink showing up. I love how you’ve structured your wardrobe–solid bottoms, definite color scheme–but I’m not sure I could restrict myself that much. I love deep, rich colors, and I love florals right now. But I have a bad habit of buying too many patterned tops and bottoms, and then nothing really goes together. So I will mull over your wardrobe structure and see how I can make mine more functional, not that 5 1/2 months pregnant is an optimal time to try to have a decent wardrobe. Funny thing–I was sitting here being amused about your color scheme, when I looked down at my outfit, which is white, black, gray . . . and hot pink. haha! yes! thoughtful, productive, let’s accomplish things today… all in bright pink! Those are great color choices, but I’m the opposite with my wardrobe. I struggle to find things to wear if I’m bored with my clothes and they don’t match the mood I’m in. I love tons of color and prints. Right now I’m into big florals. I do a lot of mix and matching with pants/ skirts/ jackets/ sweaters. My work/ going out wardrobe is great, but it’s at the expense of my casual wardrobe. That’s where I’m really lacking. A lot of my work wardrobe could be used for casual, but they are somewhat pricey pieces (not designer by any means. But around $40 per shirt/ sweater) that I think show wear if worn and washed often. I should try to find a thrift store like yours. yes, I’m sure you are MUCH more “in style” than I am — I see big florals all over the place. I think that’s what I “can’t” do though — trends. I finally catch onto a trend just when it’s fading out and then my clothes are dated already. So I just stick with the basics and that seems to work well for ME! Oh, and you should definitely check out thrift stores for casual clothing. 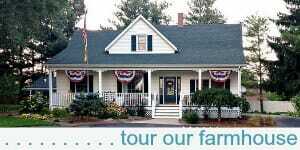 Just go without kids the first time so you have time to browse! This is a fantastic idea…I am going to go home and look at my wardrobe this evening and try to follow the same logic. I have mostly black, white and gray clothes but I love the idea of only going with one other color to mix and match better! It will make my life so much more simple. I am terrible at accessorizing so hopefully having a more strict color scheme will help with that. Thanks for sharing! I’m not minimalist or capsule with my clothing either…I do tend to wear the same thing over and over again, and I definitely go through phases of wearing the same things. It depends on my mood and how I’m feeling with my body! 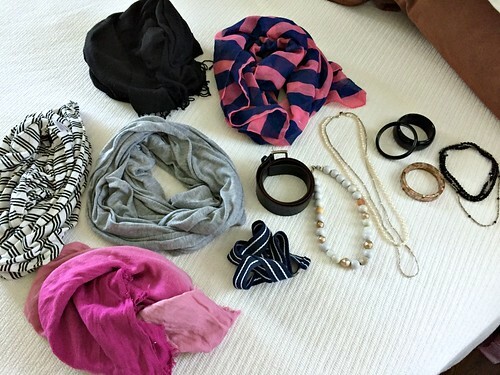 I also buy multiple of different colors when i find something I really like that works with my body! hopefully this helps you a bit — but don’t feel bad if my tips don’t work for you. I know this type of wardrobe won’t work for everyone! 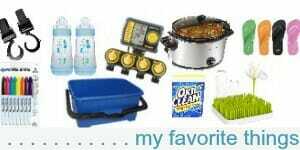 I like how thrifty and practical you are. I don’t think that a small wardrobe is for everyone, and it’s nice to see you comfortable with more things in your life if that’s what you prefer. Have you heard about Dressing Your Truth by Carol Tuttle? It’s so much more than just “learning” how to dress yourself. It’s changing my life and how I relate to others. Thanks Jessica. No, I haven’t read that book — I’ll have to look into though! I just took a look at that, and it looks to be pretty much like “Missus Smarty-Pants” (MSP, affiliated with FlyLady) with categorizing everyone as one fo 4 or 5 body types, etc. hmmm… I’ve never heard of this before — I might need to Google it! I think the point is that you’ve got to know yourself and what you want to achieve and that is definitely one of your strengths, Andrea. As for me, my wardrobe needs to fit easily into the space I have set for it, be super easy to care for, make me feel good when I wear it. My wardrobe is more minimalist but NOT a capsule. I like wearing crazy patterns and tie-dye and I don’t mind wearing the same outfits I love over and over! YES! Great comment — this is exactly what I feel too. Everyone’s wardrobe needs and wants are different based on their body type, their lifestyle, their financial position, etc. — the point is to figure out what works for you… and then DO THAT! Loaded Kale Salad... One We Actually Want to Eat!